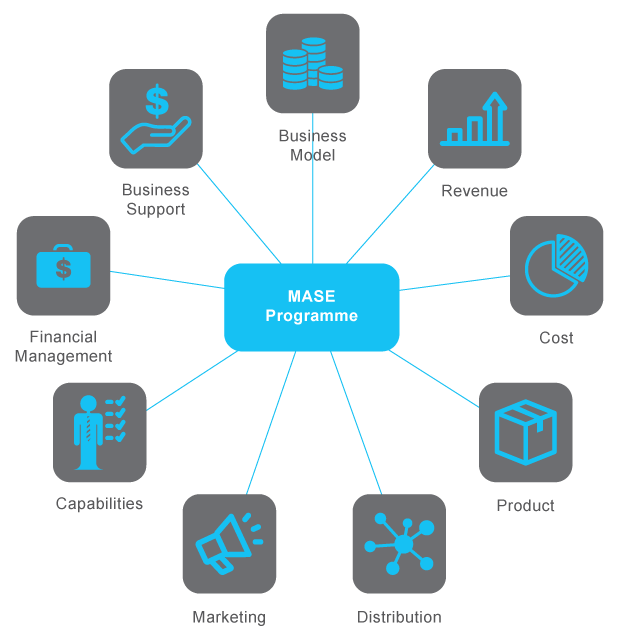 The MASE Programme tool is a starting point and is designed to be simple and easy to understand for micro and small businesses. The tool uses hypothesis-driven questionnaire to identify root cause of challenges covering all nine (9) functional areas of an organisation. Selected companies will be taken through a 6 months to 1 year engagement process. Using the results from the Diagnostic Tool, we harness Ekuinas’ resources and network to assist the chosen entrepreneurs. Aligned with Ekuinas’ social objective of empowering the Bumiputera community in the form of products and employment opportunities. A type of business that brings positive impact to the community such as products and employment opportunities. Strong growth potential with long term goals. Business challenges that are solvable within a time frame that would enable Ekuinas to have maximum impact on its contribution. Dedicated entrepreneurs with strong determination and commitment to sustain and improve the business. Our approach to building entrepreneur capacity is founded on careful and patient guidance and meaningful operational improvements. The results of our efforts should last far beyond our engagement period, i.e. positively impact the selected entrepreneurs in the years to come. For stories of our programme participants, please click here.